BLUG – Sparks on Tour! After a very successful Sparks session at Lotusphere NerdGirls is proud to announce that we are taking it on the road! Are you going to inspire the audience? So if you are going to BLUG and have an inspirational story to share let us know. And who knows, maybe your spark will be on center stage in Antwerp! Not sure what a Sparks session is? No problem. A spark session is a session consisting of a number of short (5min) speeches by people (both men and women) from the audience about something they think is inspirational. It can be on anything from work to hobby to family life, as long as it is inspirational. For some ideas check out the video’s of the Sparks that were presented at Lotusphere here. Interested in participating? Sent us a mail shortly describing your Sparks topic to info@nerdgirlgroup.com. A selection commission will pick the best submissions out for the BLUG session. We hope to see you in Antwerp! So here we are! Lotusphere is next week! Our final winner for the quiz is none other than Carl Tyler! Congratulations! Don’t forget to come to the Great Geek Challenge on Tuesday at 8PM in the Dolphin Fountain restaurant! What is the name of the giant tree destroyed in the movie Avatar? Who should have taken a left turn at Albuquerque? What do IBM, Alexander Graham Bell and Sherlock Holmes have in common? Which came first: World of Warcraft or Halo? Spark Ideas – Ready For Some Inspiration? Nerd Girls are back at Lotusphere 2012 (and if you’ve been at a user group or conference this year you may have noticed we never went away). At this year’s Lotusphere we’re changing things around and bringing you a brand new concept called Spark Ideas. It’s January, it’s Lotusphere and time to be inspired and Spark Ideas is a series of 6 minute talks aimed at doing just that and encouraging you to think differently about your world. We had lots of great submissions for Spark Ideas but in the end we wanted to put together as wide ranging selection as we could. Each speaker has 6 minutes to talk about their idea, so they and we are trying something new. I’d like to thank them in advance for sharing what are in many cases very personal stories. I hope you are able to come along and be inspired. Spark Ideas and the Spark Ideas Birds Of A Feather will be hosted by Jess Stratton. We hope to see you there. Getting up in front of people and speaking with ease and confidence is a life skill. It’s not necessarily a natural thing, so it requires nurturing, opportunity and practice. I’ve spent time in both my extra curricular life as well as my professional life at IBM encouraging children and colleagues to “Take the Stage”. I’ll tell you all about it in just 5 minutes! Six months ago cancer made an unwelcome entrance in to my life, when my wife was diagnosed with breast cancer. A cancer diagnosis is overwhelming to say the least, and comes with a lot of doctors, opinions, medications, etc. The tools you may not think of immediately to fight cancer? A positive attitude, a sense of humor, a blog, twitter, and facebook. Hear the story of how these social tools make coping with and fighting cancer easier. I’ve been fascinated by the idea of studies that prove that people who consider themselves “unlucky” turn out to be so because their mindset often means they don’t pick up on opportunities through observation and if they do they don’t act on them. Lucky people do both. It’s been demonstrated that people can enhance their own luck by increasing their awareness and willingness to act and by choosing to consider themselves “lucky” instead of “unlucky”. I will talk about examples of this in my life and how easy it is to make yourself “luckier”. We are delighted that Kristen Lauria, Vice President Marketing IBM Social Business and Collaboration Solutions, will be joining us at Spark Ideas. Since this an ambitious idea and we have no opportunity during the hour’s session for feedback, we’re going to be hosting a Birds of a Feather later the same day called Spark Ideas – The Discussion where we can take the ideas further. Congratulations to Steve Mullen! He is our first winner of 2012! Only a couple more weeks until Lotusphere! Who was Doctor Who’s first companion in the 2005 relaunch? Which sci-fi movie series features the warring factions Vampires and Lycans? What is the upcoming next-generation Wii console going to be called? What do CC and BCC stand for? Be sure and check for this week’s quiz! Congratulations! Our third round of the Great Geek Challenge quiz is over, and William Eberle was selected as our prize winner! 1) Which TV series was based on Charlene Harris’ novels? 2) Whose theoretical cat was famously both alive and dead at the same time? 3) What planet is Superman from? 4) There are 32 chessmen in a game, but how many different pieces are there? A new quiz will be up tomorrow! Selected entries will be notified via email, so be sure to put your email on your submission. Speakers selected for LS12 Spark session! All abstract submissions were shown to a panel of men and women to decide on the topics for this years Sparks session. To ensure choices weren’t made based on names we anonymized the abstracts before putting them in front of the panel. It was a tough choice as there were so many great abstracts submitted but we eventually narrowed it down to 6 topics we feel will give you an exciting and broad range of ideas! More details on each of these topics will follow next week so keep an eye out for updates on this blog! We want to thank all of those that submitted an abstract that wasn’t chosen. The quality of all submissions was really high and it made it a tough decision to have to narrow it down but we simply couldn’t place all of them. All of them however were Spark worthy! Congratulations! Our second round of the Great Geek Challenge quiz is over, and Simon Peek was selected as our prize winner! 1) What is Striders real name? Aragorn. Son of Arathorn if you want to get technical. 2) On a camera, what does a larger f-stop mean? A larger f-stop means a smaller aperture. This means letting in less light, also a deeper depth of field where more things are in focus. It can also affect the sharpness. 3) What was a spinoff of Battlestar Galactica in 2010? Caprica. It was a prequel. 4) Which building material produces a gleam, a gymnast and a pyrotechnic? Adobe produces Flash, Acrobat and Fireworks. Be sure to go check out the mobile app for this week’s questions! (We’re going even easier on you this week!) Selected entries will be notified via email, so be sure to put your email on your submission. Spark Ideas: Submissions closed and already a success! Yesterday was the last day for submitting abstracts for the Nerd101: Spark Ideas session. So far we can say it was a sounding success! We got lot’s of really good submission ranging in topics from …… Well, that I’m not going to tell you! you’ll just have to wait and see 🙂 What I am going to tell you is that the ratio Male/Female submitters was almost equal and the topics were very diverse. What happens now is that all submissions will be anonymized and put in front of a panel. That panel determines individually which they like best after which all results will be compared and the best are chosen. Keep an eye on this blog for the announcements and a big ‘thank you!’ to all submitters for their great Spark ideas, you inspired us already! Don’t miss the Spark Ideas session on Tuesday, January 17 11:15 AM – 12:15 PM at Lotusphere. 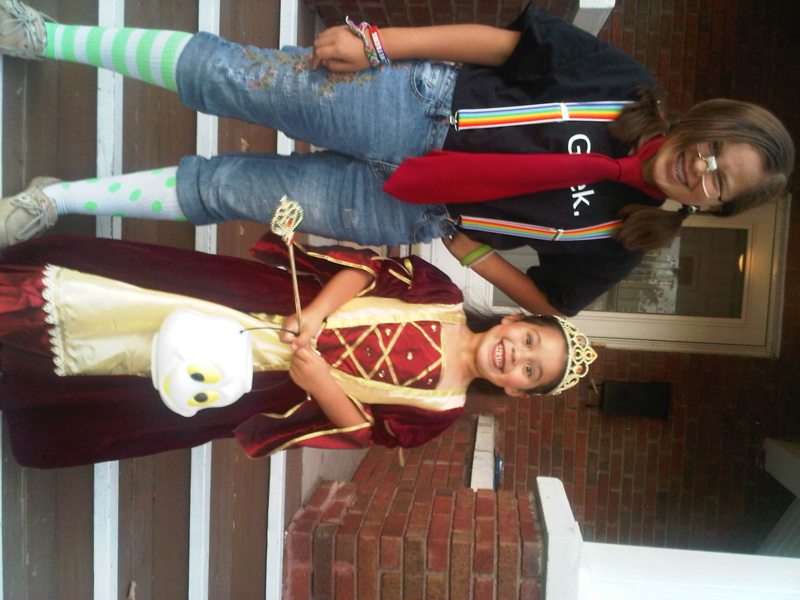 “Here are my two daughters getting ready to head out for Halloween this year. As usual, they were on far ends of the spectrum in their choices. My 13 year old decided to be a geek. I was a little put off that she went through my stuff for her costume. Her name is Laura Beth Cox, she is 13 and in the 7th grade in Columbia, MO, USA. In my completely biased opinion, she is a well rounded Junior Nerd Girl. She plays goalie in soccer and is a point guard on her basketball team. She recently won her age group in a basketball free throw contest. She plays viola in her school’s orchestra and plays in the city’s Middle School Honor’s orchestra. She does well in school, and especially enjoys math, science and reading. She gets high marks from teachers for effort and attitude in class, as well. At home, she enjoys cooking, being with her pets and hanging with friends. She also enjoys pestering her brother and sister as any Nerd Girl should. Great costumes for both! And Laura Beth, we’ll make sure your dad get’s an official NerdGirl badge at Lotusphere for you. You’ve earned it!